I haven't been to Paris in a while, apart from a short day trip a couple of weeks ago. Luckily, I had a little bit of time to spare and headed straight to FSH. Whenever I approach the store my heart beats a little bit faster... will there be new window displays or are they the same as last time.. or even worse, are they closed off for re-decoration? I am often lucky, and this time was no different... I could see from a distance fresh and beautiful autumn windows, inviting the passers-by to feast their eyes. It is always a special treat to see so many exceptional pieces in the windows showcasing Hermès' artisans' incredible skills, but it is equally wonderful to soak up the great combinations of textures and colors on display... they are such a fantastic source of outfit inspiration. Back home, I very much looked forward to creating new autumn looks with the window details in mind. 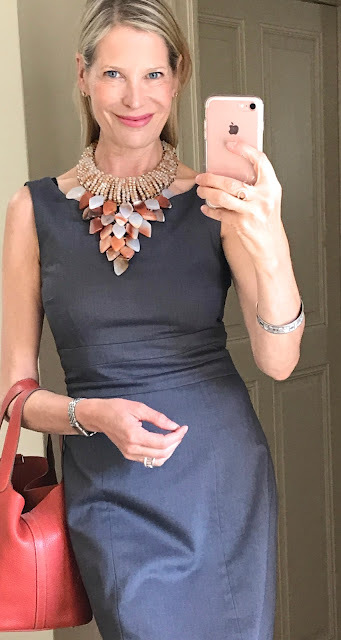 It is especially rewarding when well-loved wardrobe staples integrate seamlessly into new outifts, and it always amazes me how fresh and current they can look when combined in a new way. For fun I've included some thumbnails where some of the pieces have been shown previously... I was quite surprised by how far back some of them appeared! Capsule pieces: purple sweater and mustard skirt. Accessories: Hermes 'La Presentation de Cheveaux' 90 scarf, Chaniere bracelet in black lizard/rose gold and Picotin 22 in sanguine. Grey is such a beautiful and versatile neutral.. it can be teamed with almost any color and gives a calm, fresh and elegant touch to an outfit. No wonder that the Parures des Samourais in CW04 (ciel/vert/marron) from the spring/summer collection is a perfect scarf for autumn and winter too! Accessories: Hermes Picotin 22 in sanguine, Clic-Clac bracelet in Bleu Indiens and Parures des Samourais 90 carré. What a fun post! 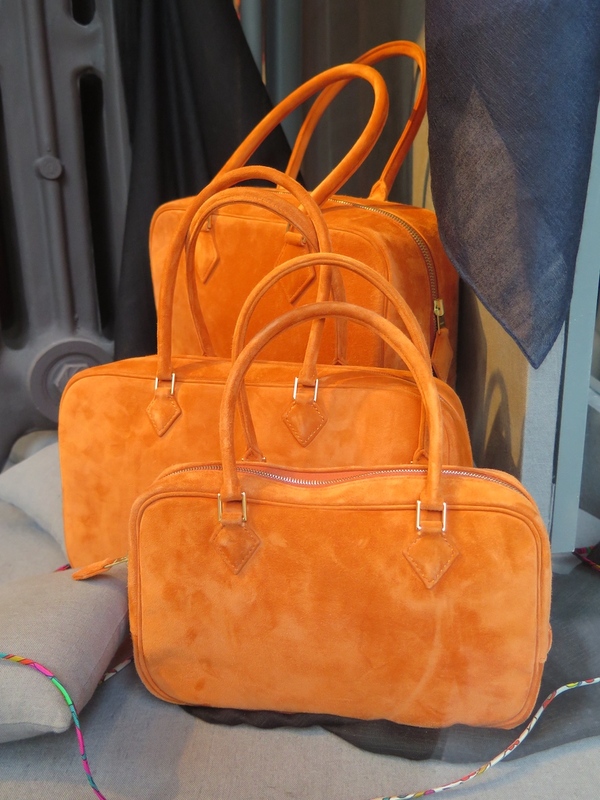 Who knew orange would be such a versatile color? 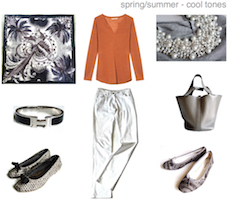 But really, as you pointed out, gray is the perfect neutral. And it was fun seeing the "oldies" and how fresh and modern they continue to look. Can't wait for Part II, dear MaiTai! How I have missed your posts... I imagine that they involve a lot of work... but they are soooo beautiful... so please keep doing them. Thanks for all the lovely window photos and modeling shots, MT. You never disappoint. Y'all, the best hurricane is the one when you don't lose power! I spent most of Saturday night listening to the wind howl and scrolling through MaiTai's recent posts--such a great distraction! I agree with Jerrine--grey is the new black! And I also agree it's still just too darn hot to even think about winter clothes, much less the fall ones! 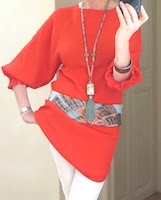 Deborah posted about the asymmetrical wrap with the criss-cross bow and I agree--it's the best! Let's see much more of that--it's so flattering and looks so fab! Greta, so happy to hear that you're still flapping around and weren't done in by whatever his name was . . . Jake? He was kind of a non-starter here, but there was still a bit of damage and the inevitable power outages. You're right - the weather is just miserable post hurricane. It's like being in the middle of a tropical rain forest. Wearing scarves at this point is out of the question; I do open the drawers and stare at mine in passing every once in a while just to keep them in line. Details and beautiful photos are up on tpf (90 cm scarves into pillows is close to the title of the thread.) Sign me up! Yes - grey! Absolutely love it. Can't get enough of it, and I'm very happy that MT featured it. More . . . more! Dearest Jerrine, - hope it's a little bit cooler by now and that your favorite autumn clothes and scarves are out to play! Too chic for words! 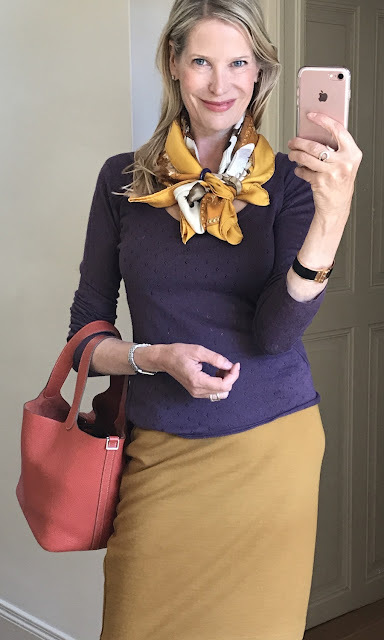 I love the autumnal hues, and especially appreciate how you put together capsule wardrobes that look so perfectly, well, perfect! 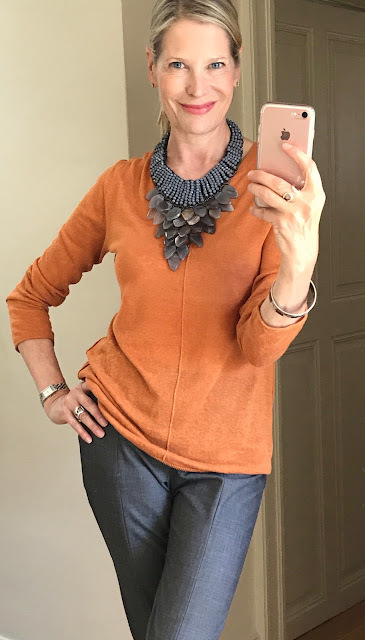 Orange in autumn is one of my favorites and I love how you've used it as a pop of color with a neutral gray. All your wardrobe posts are an inspiration for me to 'kick it up a notch' with my own wardrobe looks, so thank you! Thank you, Fifi. Dodged another one! I've always loved the combination of mustard/gold and an ink/blue. The addition of the grey really pulls it all together and makes it very now. 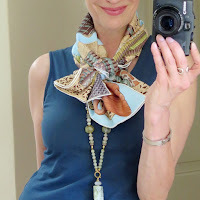 Your vintage Presentation de Cheveaux scarf is so lovely! And, I had a feeling your new beloved Samourais would travel effortlessly with you into the Fall/Winter Season -- hope to see more of it! So much great inspiration here. Looking forward to Part 2! So happy to see your post. Joining dears Ilsa and Katja on their joy for your beautiful blog. YOU ARE READY FOR FALL! IT is still bloody HOT here.......although I did buy a few pumpkins! LOVE LOVE LOVE the grey and Orange! Love it when you take us with you to visit the windows at FSH, especially this time of year. Another inspired and inspiring post! Looking forward to parts two and three. I love the scarf tie technique in the second picture- the asymmetrical wrap with the cross cross bow but I have not been able to duplicate it. An instructional video would be most appreciated! Happy you like the knot, many thanks Deborah! It's less complicated than you might think... follow the instructions of the 'Asymmetrical wrap' until the point where the ends are secured with a scarf ring. From there, follow the instructions of how the scarf ring is used in the the criss-cross bow knot. 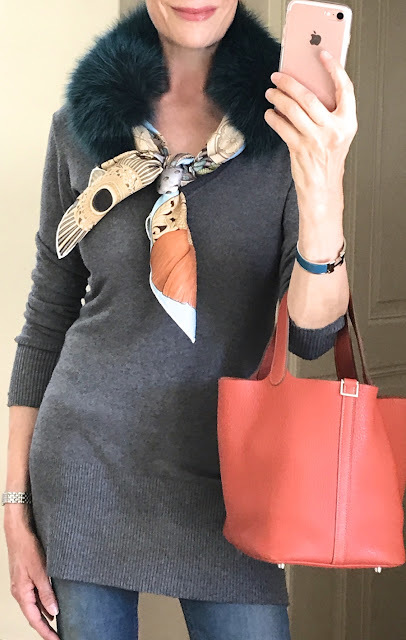 The scarf above is a very soft vintage scarf, the result with a newer scarf would probably be a little bit more bulky and less drapey. Hope this helps, good luck! Stunning ensembles and you look pretty! 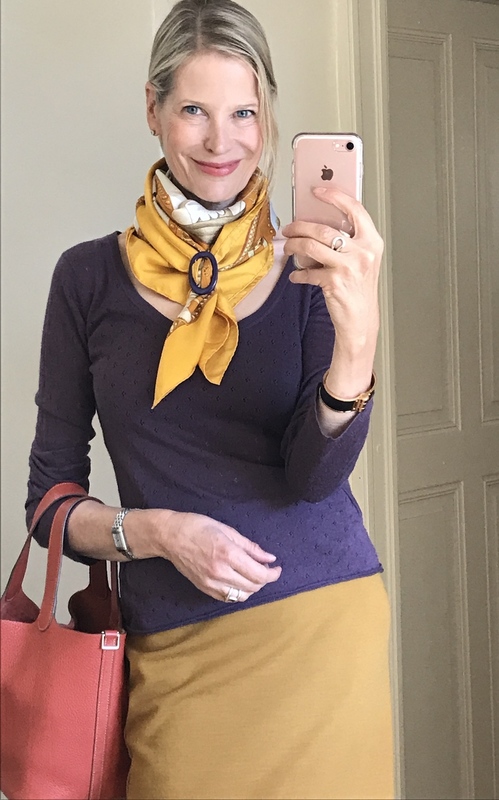 While looking at the interesting way you tied your scarf in photo two, (by enlarging the photo), I some how mysteriously was told that I successfully unsubscribed! ;-( I resubscribed, incase you are wondering why. So sorry for the subscription glitch! Not enough of a techie to understand why, but glad the re-subscription worked. Happy Sunday and have a wonderful Autumn too!